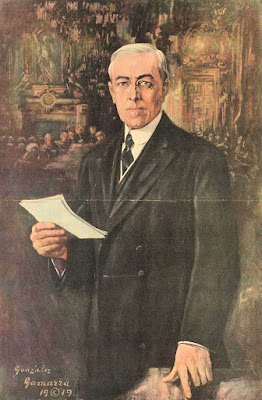 The Fourteen Points was a major policy position taken by U.S. President Woodrow Wilson and announced in a speech to Congress on 8 January 1918. The speech defined Wilsonian idealism in foreign policy, in a doctrine that came to be known as "Wilsonianism." The goal was to identify the main underlying causes of war in the entire world and to eliminate or minimize them. The first five points were broad in scope: open diplomacy, freedom of the seas, the beating down of economic barriers, the reduction of armament, and the adjustment of colonial claims on a fair basis. 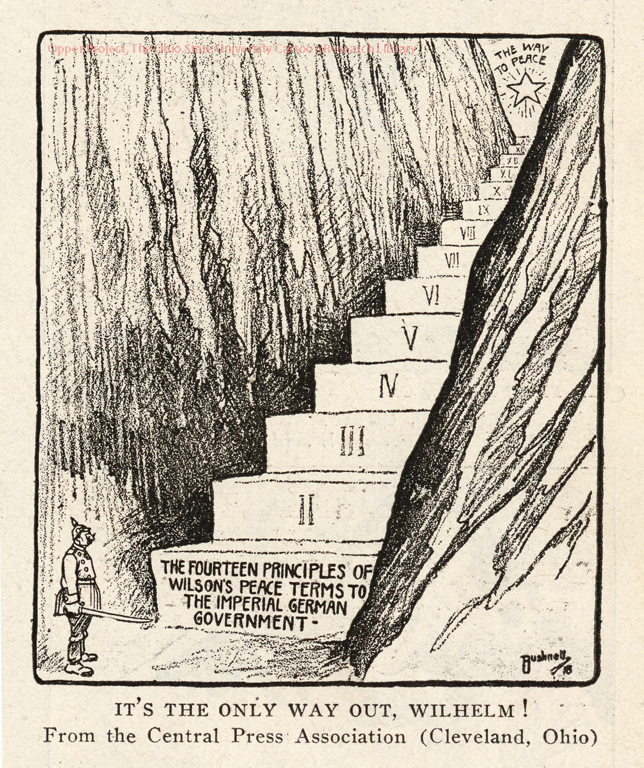 These followed Wilson's formulas for applying justice to specific countries or areas. The 14th point was a declaration in favor of an Association of Nations (or League of Nations) to resolve unexpected conflicts and thus guarantee world peace. In three follow-up addresses, Wilson set forth elaborations, clarifications and new points, bringing the total number of proposals to 23. Wilson sought a just and lasting peace—no bartering of ethnic groups; the satisfaction of legitimate national aspirations; honorable international dealing; the destruction of arbitrary militarism; and territorial adjustments in the interests of the peoples concerned, or "self determination." He was vague on the rights of minority groups in areas where self determination would be controlled by ethnic majorities. Wilson was most of all committed to a League of Nations, a peace agency that would be able to use force to preserve territorial integrity and political independence among large and small nations alike. The speech was highly idealistic, translating Wilson's progressive ideals of democracy, self-determination, open agreements, and free trade into the international realm. Much of the speech was drafted by aide Walter Lippmann. It made several suggestions for specific disputes in Europe on the recommendation of Wilson's foreign policy advisor, Colonel House, and his team of 150 advisors known as “The Inquiry.” Politically, he made a serious blunder by not seeking advice from Republican leaders in his policy formulation; some of them, such as William Howard Taft, had very similar goals in mind and could have forestalled the partisanship that caused Wilson trouble in 1919. Senate Republicans led by Henry Cabot Lodge wanted a reservation that only Congress could take the U.S. into war. Wilson refused to compromise on this issue and the required 2/3 majority for ratifying the treaty was not achieved. As a result the United States never joined the League of Nations. Wilson did not invent new terms; he pulled together the best of existing war aims, including many that had been expressed by the British and a few that originated with the Germans and the Bolsheviks, and then added a few of his own. His timing was brilliant; it was the combination that was so powerful—here was an authoritative voice, unburdened by any treaty, who proclaimed what many saw as the best possible outcome of the war, and one that would justify the horrible events by cleansing the earth and opening up a peaceful utopia. Europe went wild when he arrived in Paris, for Wilson had made himself the most trusted man in the world. The promise of national self-determination aroused audiences in Ireland, Eastern and Central Europe, Asia, and the Middle East and remains a powerful idea in the 21st century. The speech was widely hailed by public opinion in the U.S. and Europe, and drove a wedge between the German leaders and the German people, who welcomed Wilson's formula. The French government, however, wanted high reparations from Germany to pay for its past and future war costs. Britain, as the great naval power, did not want freedom of the seas. 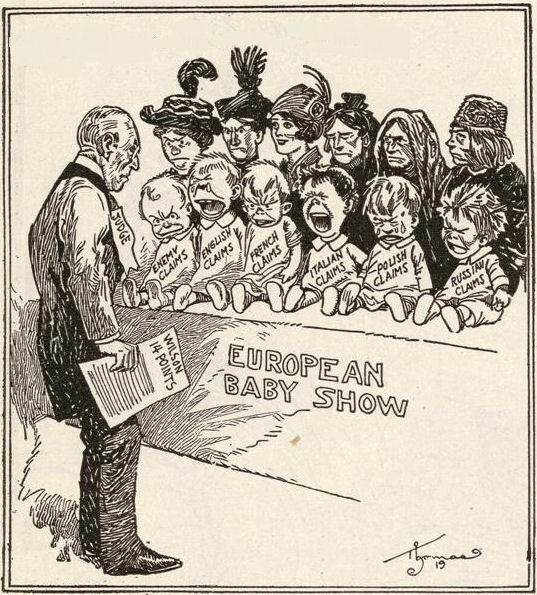 Wilson compromised with Clemenceau, Lloyd George, and many other European leaders during the Paris peace talks to ensure that most of the points, and especially the fourteenth point, the League of Nations, would be established. Fourteen Points turned out to be a crock! Even worse than a crock, perhaps. It was bait and switch of a most heinous sort. Obtaining surrender on one set of terms and then imposing another harsher set created a self righteous (and at least somewhat justified) bitterness among the German people that led eventually to Hitler. British reaction to Wilson's Fourteen Points will be reported in the coming days' postings on the Don Martin blog at www.soldierofthepen.blogspot.com. To anticipate a 1980 Boston Globe headline: More mush from the wimp.